Hothousing is what we do when we try to make our small children learn more or faster than is ‘appropriate’ for their age. It is a fairly derogatory term in the sense that it points to an unnatural, stilted way of interacting with kids: not simply encouraging their development through the old-fashioned channels of play and conversation, but actively seeking to accelerate it by the use of specially selected music, videos or classes. It is a thoroughly modern concern. Think Baby Einstein and you’ve got the picture. Hothousing isn’t all bad. It stems from the discovery – the very important discovery – that babies are far more capable from a cognitive point of view than had previously been imagined. This is particularly true when it comes to language. Experiments show that newborns, from as early as days after birth, have an unmistakeable ability to recognize cadences of their mother tongue. As a result, we now know that babies start to understand what we are saying to them long before they embark upon the road of speech themselves. Knowing this is empowering. It means that by talking to our babies regularly, by singing to them, by reading to them, we can stimulate their first efforts at communication. Early language acquisition of this kind is a promising sign for the future, but it also makes for an easier toddlerhood: a more immediate, but equally noble, goal. The 18 month old who can effectively tell you what he wants is going to be much less frustrated than the one who can’t and that is no small potatoes. And yet, and yet. Chattering to your four month old in a singsong voice about the yellow duckies on his sleepsuit is an altogether different beast from taking him to a ‘literacy class’. I saw a sign for one of these at a local softplay and I had to stifle a laugh. A literacy class for a little kid, funny enough. A literacy class for 0-9 month olds, hysterical. And rather disturbing. No doubt the class involved the usual litany of pat-a-cakes and twinkle-twinkles and all the things that are good and nice for a baby that size. But the fact that it was branded in such an intelligence-boosting, skill-mastering way is where the problem lies. Confession time. When I was pregnant with baby number one, my husband and I went to an Expo, a huge conglomeration of different booths selling the hottest and latest in baby gear. We bought one thing. It was a ‘Brainy Baby’ toy, best described as an electronic board with multiple activities on it, levers to switch, buttons to press, swirls to whirl. A toy I have now seen variations of at every toddler group I have stepped foot in. The truly embarrassing part of the story, more so than the fact that we were lured into the ‘Brainy’ tent in the first place, was that there were two versions of this toy on offer, one for the left side of the brain and one for the right, and that we actually had a conversation about which to choose. Based, wait for it, on a solemn assessment of our own intelligence. Baby Oliver needed the right-brain board, we decided, to compensate for our collective over-left-brained-ness. Oliver hated that toy. He never did baby sign language either, though I painstakingly tried to teach him and he didn’t listen to Classical music mainly because I didn’t listen to it myself. He was an early talker despite a lack of literacy classes, though he didn’t learn his letters until much later. In retrospect I am interested that I didn’t push this, touched as I was by the brainy baby culture, for he was the kind of kid who would have been receptive. I think it just didn’t occur to me that a two year old should know the alphabet. It would probably occur to me now, seven years on, as learning letters at an increasingly young age has become a hallmark of hothousing. But thankfully I have already watched two children learn to read – the purpose, after all, of knowing letters – and have seen that a toddler’s rote mastery of the ‘a,b,c’s is as connected to reading as acquiring your color words early is to art appreciation. Not wholly unrelated, but not necessarily predictive either. As a friend of a bright boy who knew his letters at two has said: I expected him to be reading by four, but it’s not the same thing. The endgame of early learning matters. We learn letters to read and express ourselves in writing, numbers to count and perform mathematical computations, colors to see and describe our environment. Sure, these are the building blocks of our ability to function (and succeed) in the world, ultimately. But ‘mastering’ them before they have meaning is an exercise only in itself. Which is fine, so long as it is fun and child-led. When it ceases to be either of these things, it’s time to reassess. Hothousing is not always about a specific task or skill set. As a general phenomenon, it is an effort to make our kids more intelligent full stop. Can we do that? Studies suggest not really. But as new parents we aren’t combing the psychology journals or thinking too rationally about it: we haven’t yet seen a child flourish in school, or in life for that matter, without literacy classes. As ever, we are simply slaves to the latest parenting trend and to the fear that our kids will somehow miss an advantage. So we pipe the Mozart into our pregnant bellies and we put the Baby Einstein on the TV and we flash the first word cards over and over again and we hope it might do a little good. And when the second kid comes along, we try to remember why it seemed so important. (Urban Moo Cow) How Should We Educate Our Children? Another interesting article – my Mother (an ex teacher) and I differ in our view on things when it comes to ‘hothousing’. Grandma insists that my elder daughter’s skills in literacy and reading come from Grandma’s use of flashcards on the 3 and 4 year old Zoe – almost exclusively! And my younger daughter’s ‘average’ reading skills are because Grandma – being too busy with elder granddaughter – didn’t do the flashcards with younger granddaughter. Personally, I think both daughters were read to as much, talked to as much (perhaps even more with younger) as each other – No.1 daughter just has a natural ability whereas No.2 daughter has to work a little harder at it. PS – I didn’t realise that Baby Einstein was supposed to help babies become Einstein! I just thought it was something different to help them (and us) relax. Duh. Shows how much I thought about these things – too busy just getting on with it! Literacy class for 0-9 months! That’s hilarious! Makes me think of that Ab Fab episode where the new parents are ready with flash cards the second that the newborn baby opens his eyes. 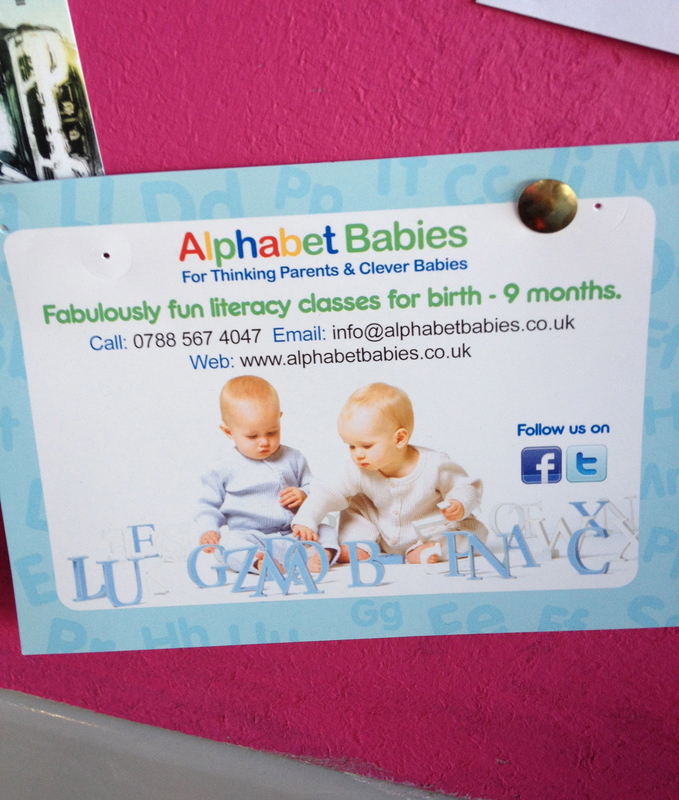 And I note that the class is specifically for ‘Thinking Parents’ and ‘Clever Babies’! Too funny. Are there prerequisites for enrolment?! Though… I have to confess I DID play Mozart at high volume while pregnant with my elder child and subjected him to Baby Einstein videos too. He’s turned out to be good at music and maths but really, I am pretty sure it’s just coincidence. Certainly the hothousing activity (if you want to call it that) never happened as much with the younger child, but then the younger one has had the advantage of sibling company from an early age, and as she’s very competitive she’s totally motivated to try everything her older brother does. That probably has as much effect as Baby Einstein. hard to know whether the mention of ‘clever babies’ is a prerequisite or a potential outcome! i absolutely agree there is a spectrum and so much of our early intervention is for the good. today’s two and three year olds are a precocious crop indeed and it will be interesting, as you say, to see if our effort at making them so begins to redefine what is ‘appropriate’ for a given age. I could not agree more. In a way, it’s almost worse for the kid who randomly memorizes letters early because expectations are so high. If you let them learn when they are ready, there is a lot less pressure.